There are signs. Signs along the trail from the past, fishing spots along the river, rock steps hidden among the now overgrown bush covering the riverbank. Here you can imagine the time when indigenous people lived on this land and cared for this place. When I've looked at the records (diaries and letter excerpts) of the early settlers to the Brisbane River valley I found much comment, heart-piercing comment, on the people referred to as 'natives' and the way the Aboriginal people were viewed and treated. For instance, the explorer Ludwig Leichardt writing to his mother in August 1843 commented: 'If the children could be taken away from the clans and brought up properly quite apart, there might be hope for them' (Brisbane History Group, 1991:72). The legacy of this view is still being felt, especially through the experiences of the Stolen Generation. But these letters also shed light on Aboriginal traditions, such as the reminiscences from the settler Charles Archer in April 1845. He eschewed the significance of the corroboree, regarding it as amusement not a sacred ceremony but observed that the men wore feathers in their hair and body designs painted with red and white clay. They danced while the women performed body percussion and drummed on kangaroo skins stretched tight across their laps. The local Turrbal people were fishing people and who are still intimately involved with the river place of their heritage. Their website tells the history of their river connections along the Brisbane River (Turrbal Association Inc., nd). Today the tortoises are gone; the turbidity and pollution of the river has affected both inhabitants and ecosystem. But in the 1820s, in the early days of European exploration and settlement, when the settlers lived off the land, they reported an abundance of fish of all varieties, as well as freshwater mussels found in 'clear greenish water' (Gregory, 1996:8). Different fish species flourished and signs they were numerous were found in the flowering of local trees and the appearance of certain species of birds. Gregory (1996) reports that blue mountain lorikeets announced that mullet had arrived, water lilies in bloom signified plentiful mussels, while the silky oak in flower indicated eels were about. Who holds this precious knowledge? And along the riverbanks, do these trees and plants still flourish? Are the mullet still running? Do water lilies still grace the water? 'The wood on the banks - Fig tree, Blue gum, Swamp oak, and Iron bark,...here and there a solitary cedar - On landing found spinage in great abundance, mint, parsley, and the wild poppy. ...Whilst dinner was preparing, took a walk into the coutnry, found it delightful, thinly wooded...occasionally thick bush with little marks of natives having been there. Several very fine eels were caught here, and a fish called the cat fish' (Gregory, 24). 'a tangled mass of trees, vines, flowering creepers, staghorns, elkhorns, towering scrub palms, giant ferns, beautiful and rare orchids and the wild passion flower, while along the River bank were the water lily in thousands and the convolvulus of glorious hue...' (Gregory, 26). But this edenic riverscape gradually made way for 'villas', commerce, sanitation and industry which, in 1850s led to an influx of sharks into the river attracted by the waste from tallow and hide factories along the river, rendering 'it dangerous to bathe' (Gregory, 33). Sugarcane was planted at St Lucia and the enormous fig trees, where a human looks the size of an ant against the huge spreading trees, were logged. That place is still known as Fig Tree Pocket. But back in 1883 the writer Archibald Forbes still relished the allure of the waterplace -'You turn your back on it with regret for it is ever a thing of beauty.' That thing of beauty still flows through the city. Yes it is channelled, freewayed, de-treed in many places, overdeveloped, but its identity is still there in the term for Brisbane 'river city'. To me it is lustrous, and as Forbes noted in 1883, 'it flows at your feet, sparkling up into your face in that mellow sunshine which makes Queensland winter an abiding joy' (Fisher, 1990:188). Fisher R, 1990, The Brisbane River Personified: Historical Perception Since 1823, in P Davie, E Stock, & D L Choy, eds, The Brisbane River: A Source Book for the Future, Moorooka, Australian Littoral Society Inc & Queeensland Museum. 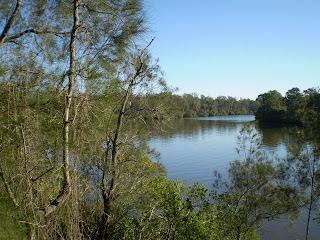 Gregory H, 1996, The Brisbane River Story: Meanders through Time, Yeronga, Qld., Australian Marine Conservation Society. Brisbane History Group, 1991, Brisbane River Valley: Pioneer Observations and Reminiscences 1841-50, Brisbane History Group, Sources No 5.